15 Cool Things You Should Know About "Animaniacs"
This classic '90s cartoon could have been about ducks. 1. Originally, the characters were intended to be three Warner brothers named Yakki, Smakki, and Wakki. They were also ducks. 2. Voice actor Jess Harnell, modeled Wakko's voice after Ringo Starr. He speaks with a Scouse accent. 3. Dot’s full name, "Princess Angelina Contessa Louisa Francesca Banana Banna Bo Besca the Third" was inspired by Pippi Longstocking's long real name, "Pippilotta Delicatessa Windowshade Mackrelmint Ephraim's Daughter Longstocking." 4. Ralph the Guard was originally a minor character on Tiny Toon Adventures. 5. Pinky and the Brain was inspired by two producers of Tiny Toon Adventures, Tom Minton (L) and Eddie Fitzgerald (R). 6. "Hello-o-o, nurse!" was originally intended to be Buster Bunny’s signature catchphrase. It was dropped because it made no sense for the character. 7. Producers originally wanted Patrick Stewart to voice Brain. 8. The character of Minerva Mink starred in the least number of solo shorts (only two). Reportedly, her character was scaled back because she was too sexually suggestive for the show's intended audience. 9. Nancy Cartwright, who is best known as the voice of Bart Simpson, voiced the character of Mindy. 10. The show was actually very popular with adults. In 1995, more than one-fifth of the viewers were 25 years or older. 11. Critically acclaimed Broadway actress Bernadette Peters, voiced Rita. 12. The recurring segment, "Wheel of Morality," was created to fill time when an episode was running short. 13. From 1995-2000, DC Comics published an Animaniacs comic book. 14. 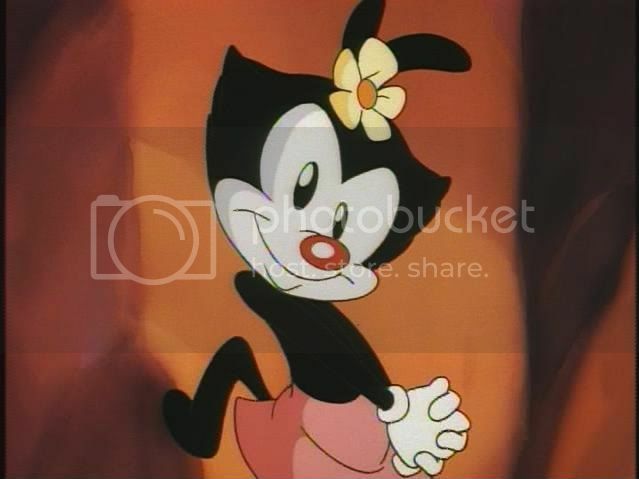 The first and only time the Warners' parents are shown was in the 1999 direct-to-video movie, Wakko's Wish. No explanation is ever given to what happened to the Warners' parents. 15. Pinky and Brain starred in two spinoffs: Pinky and the Brain, and the less memorable, Pinky, Elmyra and the Brain.